The Biggest Loser is one of America’s top TV shows, where people win by losing weight. You too can be a part of the excitement, getting fit and healthy whilst having fun. BiggestLoserClub.com offers two programs to help you out: The Club and Bootcamp. The Club includes a 6 week weight loss plan, which includes workouts with professional trainers, community support, meal plans and recipes, plus exercise and food trackers. This is probably best suited to people who are just starting out and need a quick burst of inspiration to help lose weight rapidly to begin with. Once that’s worked its magic, you may wish to progress to the Bootcamp. 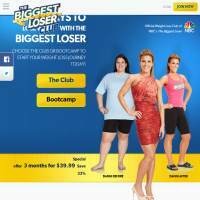 The Biggest Loser Club Bootcamp is an online resource full of regularly-updated workout videos which feature professional trainers and TV personalities (Dolvett, Jessie and Jen). You receive motivational emails with tips and new techniques. This also includes meal plans and shopping lists with additional recipes. It’s a more expensive package, but leads on nicely from the initial Club membership. There’s no doubt that the site is borrowing the excitement surrounding the TV show, but that’s not to say it’s ineffective. This is a fairly slick operation, and since new videos and tips are regular, and you receive direct correspondence from the team, you feel part of the hype. If you’re the sort of person who appreciates support, you may benefit from this. As well as receiving emails, you can also become a part of the BiggestLoser Club community, although this tends to mainly include reading blog posts. Still, the blog also includes a lot of helpful videos on simple ideas such as how to weigh food properly, as well as some recipes. Recipes are pretty standard here, but look tasty nevertheless. Tools include food and exercise diaries, which is good to see, although we couldn’t find many calculators (other than a weight tracker) to help you work out exactly what you’re eating, how much you’re losing through exercise, and what the overall balance of calories and nutrients might be. It’s also not that easy to customize diets, and you will generally need to develop your own plans after the initial 6 week plan, particularly if you like or dislike particular foods. Biggest Loser Club isn’t the cheapest option, but it does have plenty of workout videos, some decent tools and meal plans. It’s Bootcamp is a nice way to progress once you’ve shed the initial weight through their 6 week program, and whilst it might lack a few features and depth, there should be enough there for most people to be inspired.